I have to apologize for not posting much this past week. We’ve been crazy busy and I just haven’t had time to write. Hopefully this coming week will be a bit calmer. If we can save time it’s a bonus for us. Yes, I freely admit that I sometimes use a bread machine to save time, but I also know how to make bread by hand and sometimes I do. We’re so busy all of the time with the animals, garden, events, friends and family that half the time I don’t know how we have the time to do anything else. Friday nights are pizza nights around here. Other than making the crust, the sauce is what can take the most time. It also seems a waste to open a quart of tomato sauce to make a cup of sauce so this year we decided to go ahead and can sauce. We put the sauce in 8 oz jars which end up being the perfect amount for one large pizza. It cuts our kitchen time in half by having these little jars. I nearly wasn’t going to be able to post this recipe because we no longer had any tomatoes but Tom’s boss gave him two buckets of green tomatoes (green tomato recipe coming up next week). In that bucket there were quite a few red ones, actually more than I expected so I was able to make 12 more jars of it and finally make a post. It doesn’t really matter how many tomatoes you have to do this because it can be multiplied or divided how you like. 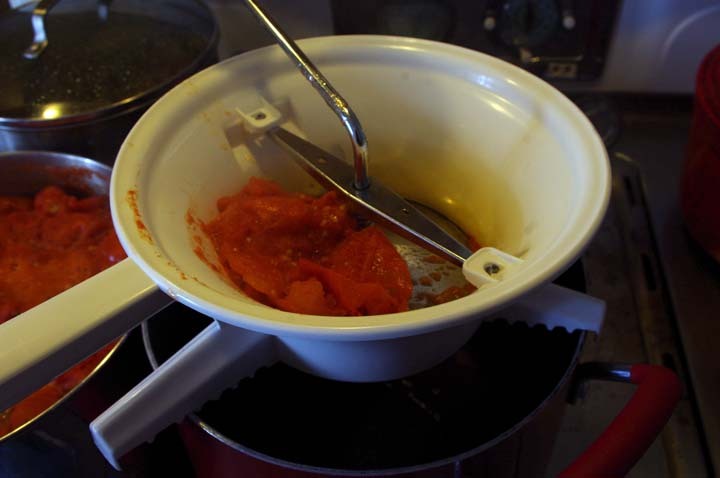 If you process a lot of tomatoes I highly recommend investing on a food mill. It doesn’t need to be fancy, it just needs to do it’s job. Using a food mill really saves us a lot of time while making the sauce (Yay! more times saved!). 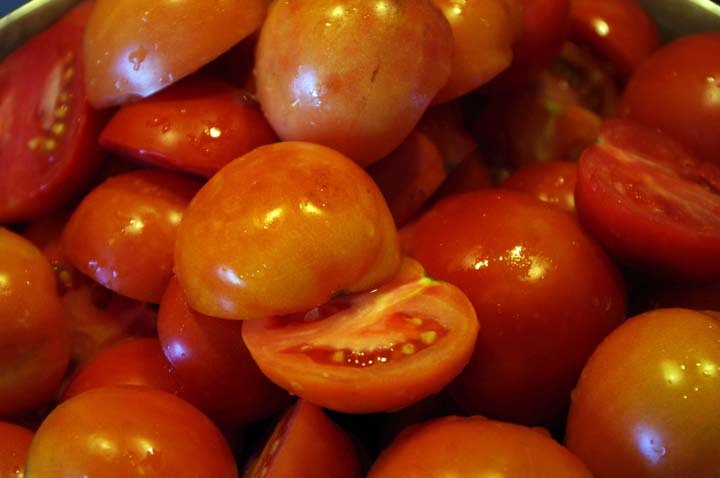 You don’t need to skin and seed the tomatoes first. Just simply half or quarter the tomatoes and throw them into a pot. Bring them to a boil and let the tomatoes cook down. Once they are soft run them through the mill to remove the seeds and skins. This also makes the sauce smooth. If you don’t have a mill go ahead and skin and seed them first. Put them in a pot and boil them down. 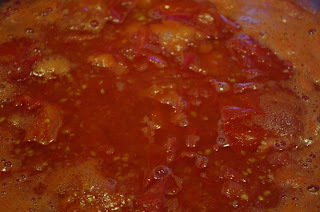 In batches, blend the tomatoes until smooth or use an immersion blender. Bring to a boil and then reduce to a simmer. Simmer down the sauce and herbs until it reaches the desired consistency. 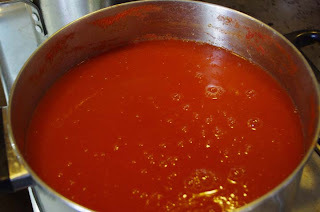 This, of course, is a personal preference but can take over an hour depending on how much sauce you have. While it’s simmering prepare your jars and to each 8 oz jar add 1.5 tsp lemon juice. 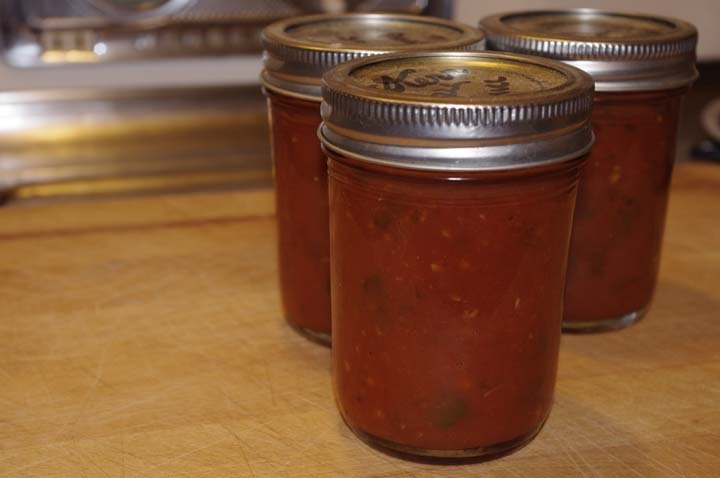 Ladle sauce into jars and then process in a water bath canner for 35 minutes. I found 3 Tbsp of salt per 4 cups of tomato juice to be WAY too salty. I had to add some store-bought canned tomato sauce to add to it just so it wouldn’t burn! Is it possible that you meant to add the salt *after* cooking it down to the desired consistency? Aiden, it’s too salty because the recipe calls for 1 Tbs of salt per 4 cups. 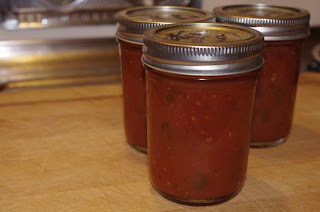 I just finished making this recipe 20 min ago for a class on tomato canning that I taught today and it came out fine. I actually did use just 1 Tbsp per four cups… I think the math problem to leave a comment made me have a typo! The type of salt very well could be the problem. I generally use course sea salt in my recipes which is substantially less salt by weight than pickling salt would be. A tablespoon of sea salt weighs 1/2 ounce while a tablespoon of pickling salt weighs 3/4 ounce. I suppose I should start doing salt measurements by weight instead. Or at least specify the type of salt to use. I’m sorry your sauce came out too salty.